My aerobics teacher, Reme, came into morning gym class with bags of weeds, offering them to anyone willing to try. “Verdolaga,” she said. “It grows wild in my garden. I use the leaves in salads.” I pulled one of the glossy leaves off a stem and tasted. A little tart, nice. An on-line search revealed that verdolaga is purslane, a weed, an herb, a wild green. It’s used in Greek and Middle Eastern cooking, one of many wild herbs used in salads and cooked dishes. The Mexicans favor it, braised with pork or chicken in a green chile sauce with tomatillos. 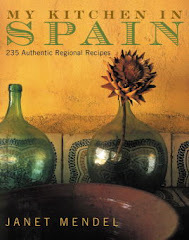 In a cookbook from the Valencia region I discovered a recipe with purslane, in "ensaladas de los frailes"—the monks’ salad. It calls for three kinds of wild greens, verdolagues tenders (tender purslane), camarroges (bitter wild chicory) and lletsons (cerraja in castellano; sow thistle in English) mixed with canned tuna, black cuquello olives, olive oil, black pepper and salt. I also discovered that verdolaga, common purslane (portulaca oleracea) is a real superfood, rich in anti-oxidants, vitamins and minerals and amazingly high in heart-healthy Omega-3 fatty acid. A purslane salad and a heap of sardines (also rich in Omega-3) would be a real heart-protective meal. Eat your weeds, kids! Both leaves and stems of purslane are edible. Pinch off leaves to use in salads. They are glossy on the top side, quite fleshy. Wild purslane grows in lawns, along roadsides, in fields. It should be picked from places where it’s not subject to pollution or pesticides. (Hey, it’s growing in my garden too!) It may turn up at farmers’ markets too, as it seems to be trending. Stems, leaves and yellow flowers are edible. Place in a bowl of water and swish them around. Drain. They can be used raw or cooked. I used the leaves in a salad, combining them with watermelon, cucumber and feta cheese. I made a traditional vegetable dish, called zarangollo, cooking purslane with the vegetables. Purslane leaves add a mild citric taste to a salad of watermelon and cucumber. 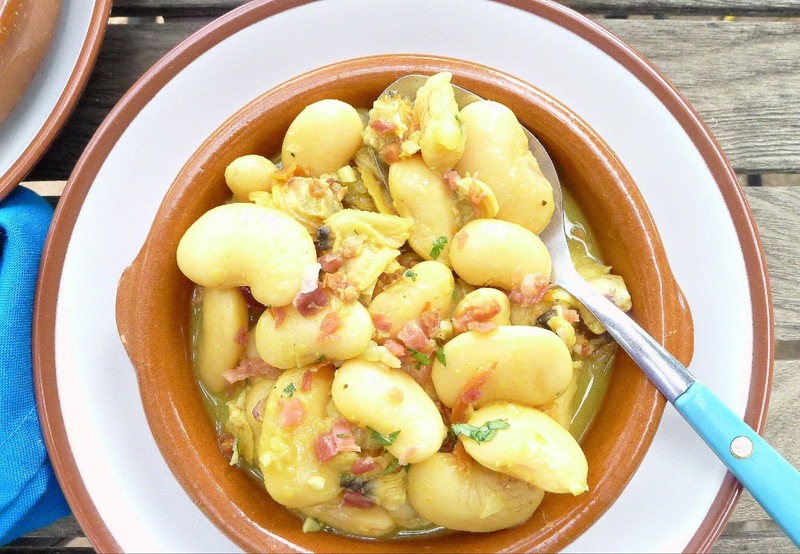 Chopped purslane cooks with potatoes and zucchini in zarangollo, a Murcia dish. Serve the zarangollo on toast as a tapa. The salt in the dressing draws the liquid out of the watermelon and cucumber. Either add the salt, oil and lemon juice to the salad immediately before serving. Or, mix it all together and refrigerate. When ready to serve, use a slotted spoon to scoop the salad out of the accumulated juices. Combine the watermelon, cucumber and purslane in a bowl. Add the scallions, salt, pepper, oregano, feta cheese, olive oil and lemon juice. Zarangollo is a popular dish in the Murcia region (eastern Spain). It usually consists of zucchini and potatoes cooked with onions in olive oil and scrambled with eggs. 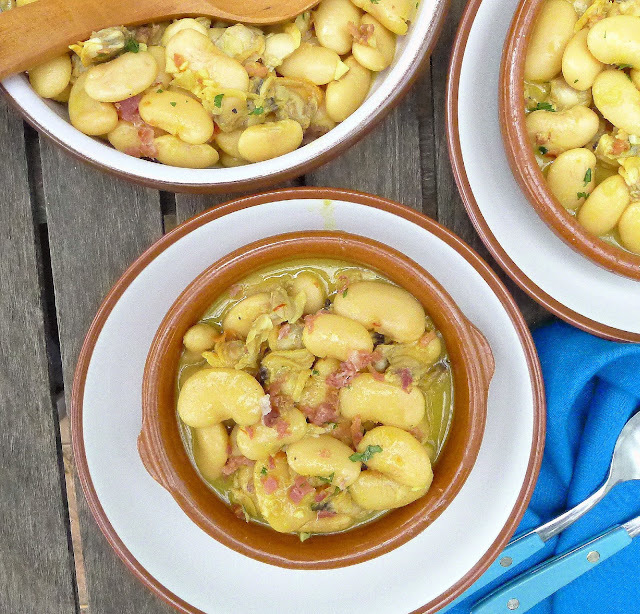 It´s served as a tapa or light supper dish. This version has wild purslane added to the vegetables. Blanch the purslane in boiling water for 1 minute. Drain and reserve. Heat the oil in a cazuela or large skillet. Add the potatoes and cook them, covered, stirring frequently, on medium heat 10 minutes. They do not need to brown. Add the onions, zucchini, bell pepper and blanched purslane. Season with salt and pepper. Cover and cook, stirring occasionally, until potatoes and zucchini are tender, 10 minutes more. Break eggs directly into the vegetables and stir them in. Break eggs into the vegetables and stir them to mix. Cook only until eggs are set. Serve hot or room temperature accompanied by toast. Another recipe for zarangollo is here. A recent story about purslane in the Chicago Tribune is here. Every now and then a new product or ingredient shows up in my kitchen to pique my culinary interests. This week my son Ben came home from a trip to Galicia and Asturias (northern Cantabrian coast of Spain) with a bagful of cans and jars of products made with algae and a cookbook to go with them. 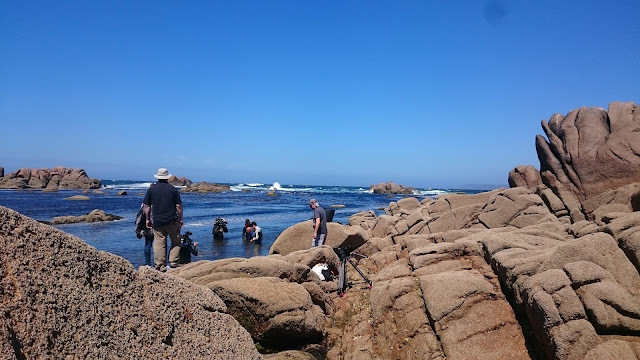 Cocina con Algas (Cooking with Algae) is an introduction to seaweed cuisine published by Porto-Muiños, a small, family-run company in A Coruña that packages edible seaweed harvested in Galicia and products made with seaweed. 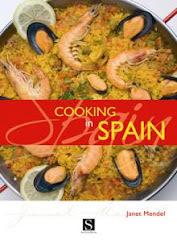 In the book's intro, the company’s owner, Antonio Muiños, enthusiastically relates the firm’s mission as to take seaweed out of the exotic and make a place for it in the everyday diet. He’s collaborated with two well-known chefs, Oriol Castro and Eduard Xatruch (Michelin-starred Disfrutar in Barcelona) who developed the recipes with the object of ending the prejudice that seaweed is only for Oriental cuisines and of bringing verduras del mar (“sea vegetables”) to a wider public. 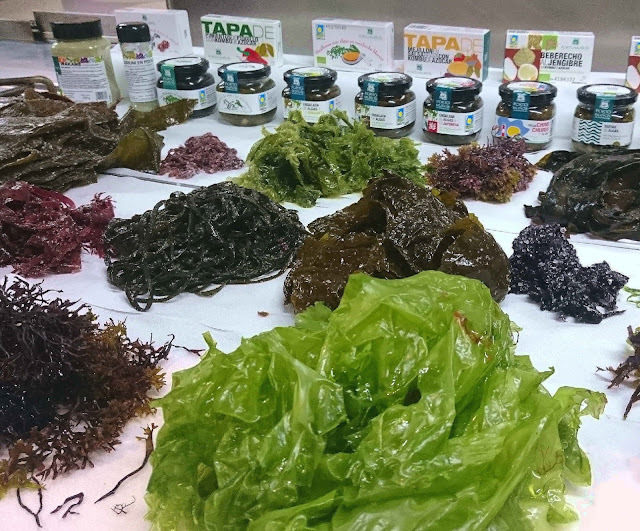 My adventures with algae began with processed seaweed products, packed in cans and jars, brought back from Galicia. I have wakame al natural; a Japanese algae salad (with three kinds of seaweed in a soy sauce dressing); mussels with wakame in escabeche. At my local health food shop I found a full range of dried seaweeds. I came home with a “starter kit” of sea spaghetti and kombu. 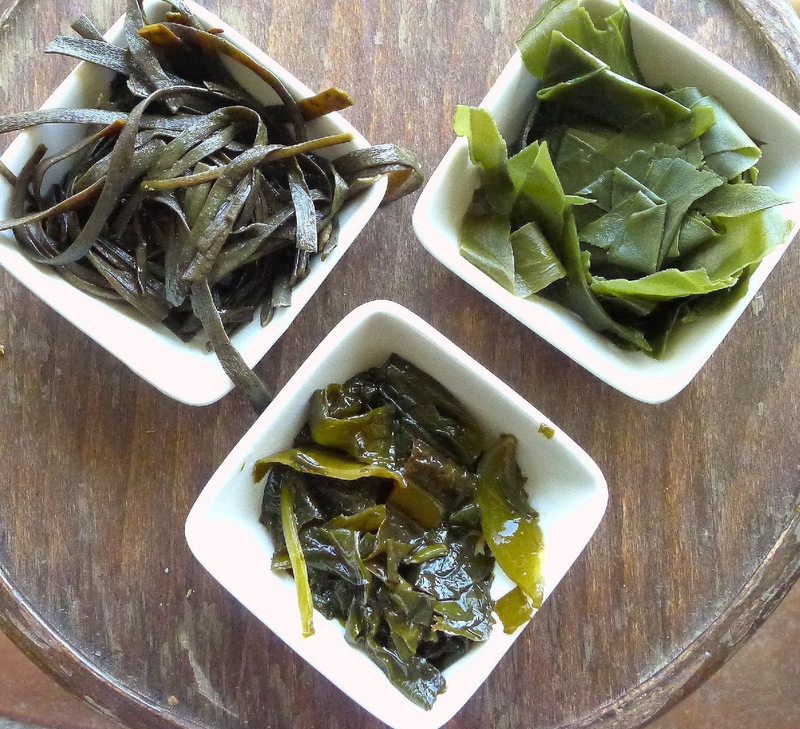 The cookbook includes directions for preparing each of eight different seaweeds (in addition to sea spaghetti and kombu, they are sugar kelp, sea lettuce, wakame, Irish moss, nori and dulse). Kombu requires 8-10 minutes soaking to rehydrate it, then 35-40 minutes cooking in water. Sea spaghetti, also known as "thongweed," long, brown “noodles,” requires 10 minutes soaking and only 10 minutes cooking. Both increase their volume about four times. Wakame needs 10 minutes to soak and 5 minutes cooking. It increases weight by ten times. (I used wakame canned in brine, so I didn’t need to soak and cook it. How do they taste? Kombu has a pleasant iodine-y, seawater taste with a slight smokiness. It’s not at all fishy, but makes a good addition to soups and rice dishes in place of seafood. It’s chewy, in a nice way. The sea spaghetti is mild in flavor—sort of vegetable-y, think green beans and asparagus—with a texture like al dente linguine. Wakame has a delicate seafood taste, meaty texture and a slightly slimy consistency. Perfect in stews, I think. 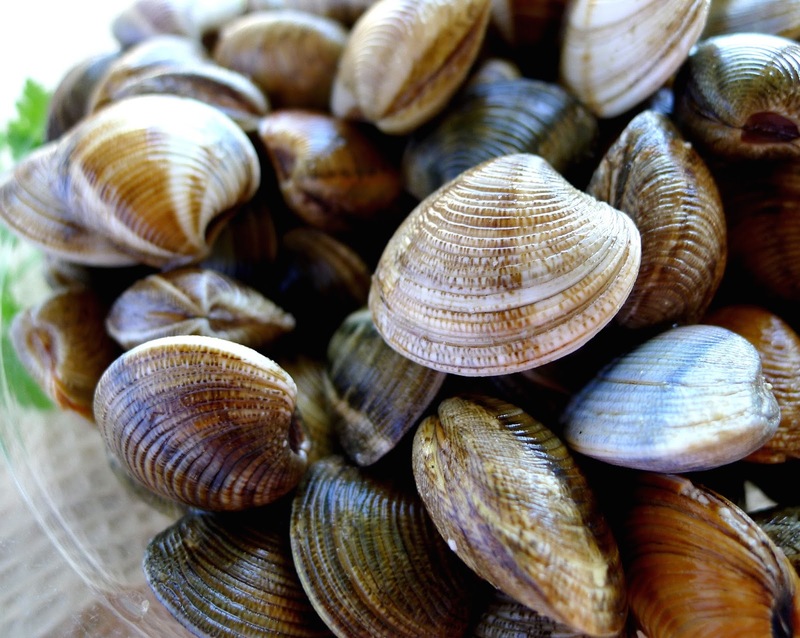 • Add a piece of seaweed to the pan when steaming open clams or mussels. Amazing flavor enhancer. 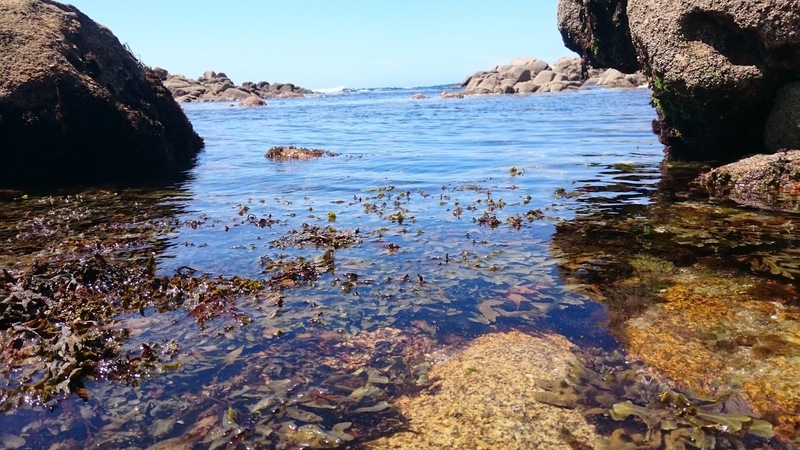 • Spread dried seaweed (not soaked), such as sea spaghetti, kombu, sea lettuce, wakame, sugar kelp, nori or dulse, on a baking sheet and roast at 350ºF 5-8 minutes, or until very crisp. Break it up and crush in a mortar. Shake it through a sieve. Use the seaweed powder as a seasoning in place of salt. It goes well with eggs, fish and all vegetables. 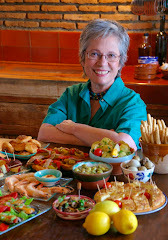 Here are some recipes adapted from Cocina con Algas. 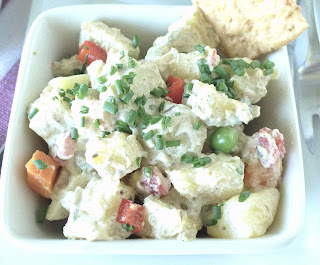 "Russian" potato salad has pureed seaweed added to the mayo. Filleted sardines are briefly baked with a filling of Japanese-flavored seaweed. Noodles!--thin strips of squid, whole-wheat spaghetti and sea spaghetti (seaweed) with a garlicky ink sauce. Ensaladilla rusa, or “Russian” salad, is one of the most popular of Spanish tapas. It’s a salad of diced potatoes, carrots and peas dressed with mayonnaise. In this version, part of the mayonnaise is replaced with “tartare sauce” made with pureed algae. I cooked the potatoes in a pan of boiling water with the kombu seaweed that I used to make the tartare sauce, adding the sea spaghetti for the last 10 minutes of cooking. 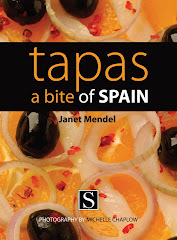 Serves 6 as a tapa or side dish. Put the potatoes and carrot in a pan with water to cover. 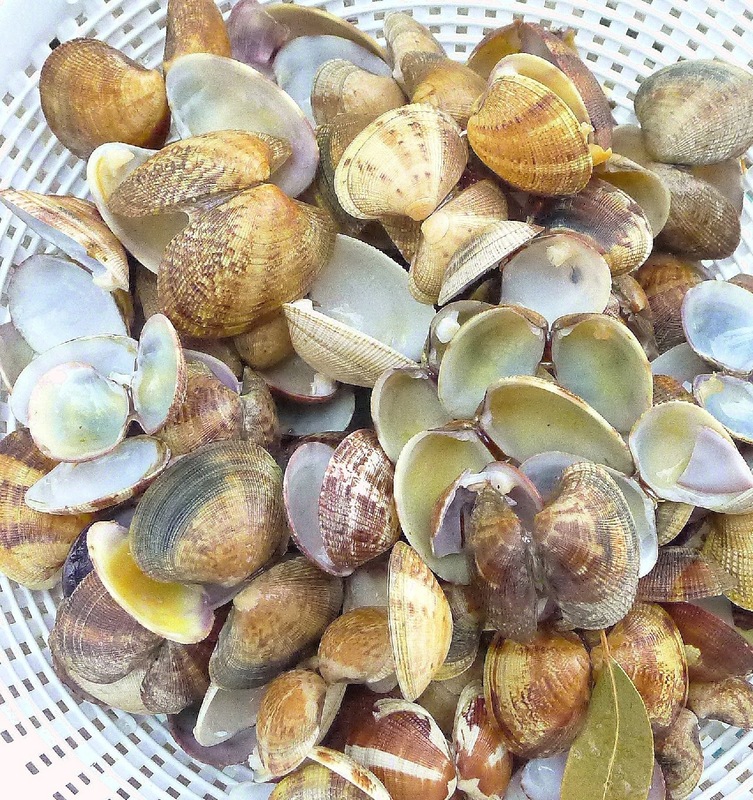 Bring to a boil and cook until potatoes are tender, 15-20 minutes, depending on size. Drain. When potatoes are cool enough to handle, peel them and cut them in ¾-inch dice. Peel and dice the carrot as well. Place potatoes and carrots in a bowl and add the oil. Add the egg, chopped pimiento, scallions, pickle, parsley, salt and pepper and mix well. In a small bowl, stir together the mustard, mayonnaise and tartare sauce. Add a little vinegar to thin the sauce. Stir it into the potatoes. Taste and add more salt or vinegar as needed. Chill the salad. 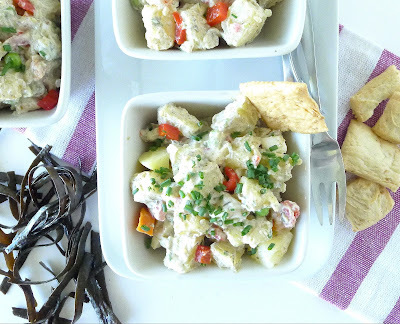 Serve the potato salad in individual tapa dishes. Sprinkle with chives. Accompany with bread sticks or crispy regañas crackers. This is my own version of a seaweed tartare sauce, an ingredient called for in the recipe for ensaladilla rusa (“Russian” salad) in the algae cookbook. The sauce is produced by the Porto Muiños company, but I did not have a sample of it. This makes about 1 ¼ cups sauce, more than you will need for the potato salad. Use the rest as a dip, straight or mixed with mayonnaise. Suggestions from the cookbook are to use it with smoked salmon, on toast with fresh anchovies marinated in vinegar; with stuffed eggs; with potato foam. I used three kinds of seaweed in the sauce blend--sea spaghetti on the left, kombu on the right and wakame below. Put the three kinds of seaweed in a blender or food processor and blend them until fairly smooth. Add the shallot, mustard, olives, oil, salt and lemon juice and process until sauce is very smooth. Sauce keeps, refrigerated, for 1 week. Sardines with a Japanese flavor, seaweed stuffing and shitake sauce. This recipe, straight from the cookbook, uses two prepared ingredients—Japanese seaweed salad (with sea spaghetti, wakame, kombu, olive oil, sunflower oil, soy sauce and sesame seed) for the stuffing and shitake mushrooms Japanese style for the sauce. The recipe calls for the sardines to roast for only 2 minutes. I roasted them 3 minutes and they were barely done. Maybe the chefs intended for them to be raw-ish, a la Japanese. Use fingers to "unzip" the spine of sardines. Remove heads, scales and guts from the sardines. Rinse them in running water. Using fingers, pinch the center spine of the sardine, carefully lifting it out. Cut away the spine at the tail. Use scissors to cut out the dorsal fin. Spread the sardines open and blot them with paper towels. Open and drain the can of algae salad. Place a small mound of it in the center of each sardine. 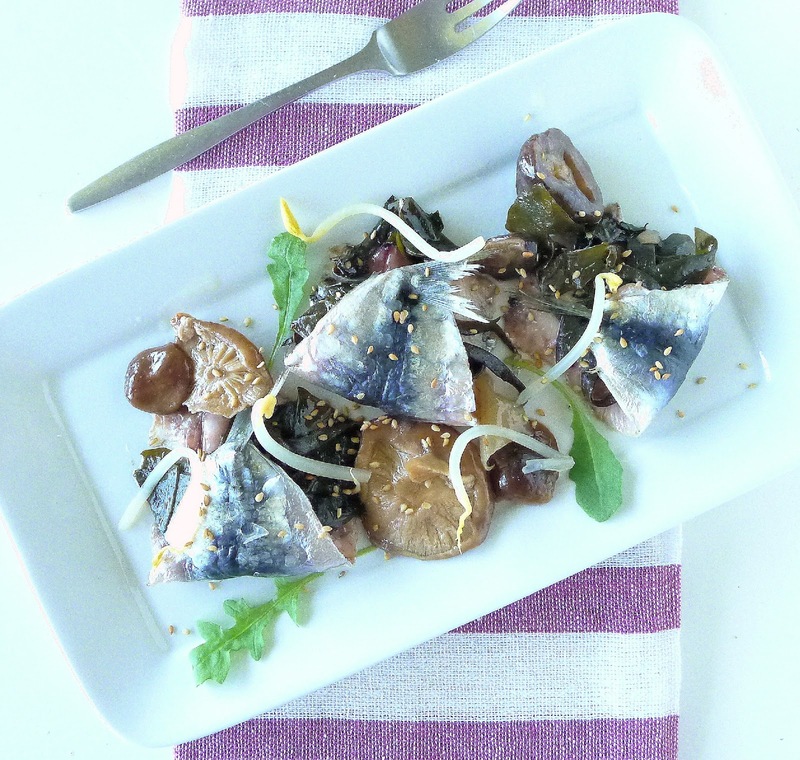 Fold the sardine over on itself to enclose the seaweed salad. Preheat oven to 350ºF. Season the sardines with salt. Place them on an oven sheet that has been lightly oiled. Bake 2 minutes (raw in the center) or 5 minutes (done). Open the can of shitakes and heat them in their juice. Place 3 sardines on each plate. Divide the shitakes between them. Sprinkle with sesame seed and garnish with bean sprouts and cress. The chefs’ recipe for this dish calls for a Porto-Muiño product, a wheat linguine flavored with powdered nori. I didn’t have this specialty pasta, so I improvised, using half whole-wheat spaghetti and half sea spaghetti, the seaweed. I love this seaweed! Squid ink adds extra flavor to this dish. You can use the ink sacs from fresh squid or, easier, frozen sachets of ink. Spoon the finished garlic-oil-ink sauce over the pasta. Don’t mix it, or it will blacken the noodles. Soak the sea spaghetti in salted water for 10 minutes. Cook it in boiling water for 10 minutes. Drain and reserve. 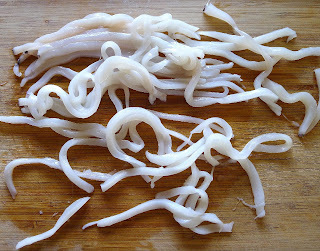 Cut squid into very thin "noodles." Cut the body pouch of the squid open lengthwise. 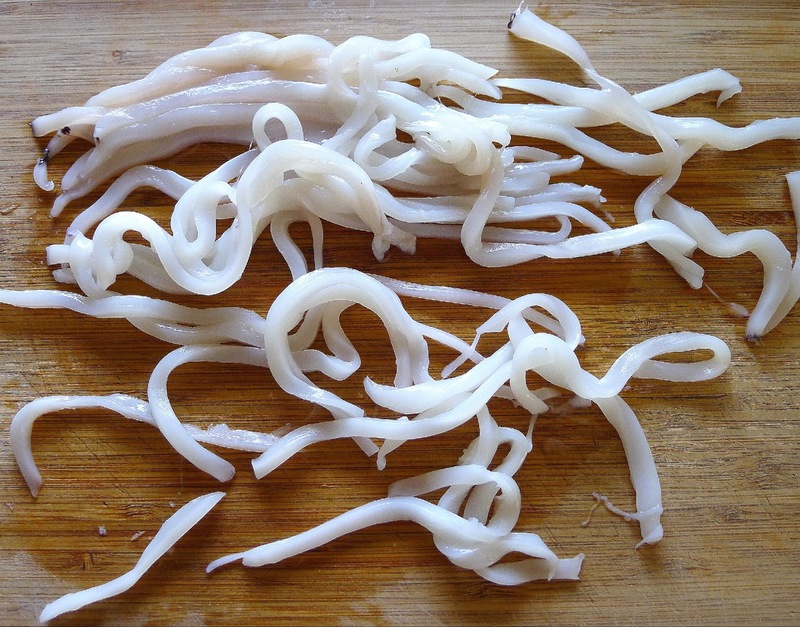 With a sharp knife, cut the squid lengthwise into very thin strips (1/8 inch wide). These are the squid “noodles.” Cover and refrigerate until ready to finish the dish. Place ½ cup oil in a pan. Add the garlic and chile to the oil. Heat until garlic begins to fry and turns golden. Remove the pan from the heat and skim out the garlic and chile. In a small bowl add the contents of the packets of ink to the water and stir to combine. Add the ink to the pan with the oil. Cook the whole-wheat spaghetti in boiling salted water until al dente. Drain and set aside. Heat remaining ¼ cup oil in a large skillet on medium-high heat. Add the squid and sauté just until it turns translucent, about 2 minutes. Add the cooked wheat spaghetti and the reserved sea spaghetti. Toss the spaghetti with the squid. Season with salt. Carefully reheat the garlic-oil-ink sauce. Divide the squid and noodles between four plates. Spoon the garlic oil over them. Sprinkle the reserved fried garlic on top. Sprinkle with chopped chives. I'm sprinkling that powdered seaweed on everything--corn on the cob, scrambled eggs, salad with tuna, green beans. Love it. It's intensely salty, but seems to enhance other flavors. The only gripe I have about seaweeds is that they are drab brown, green, black in color. Can't really use it "straight" in place of mayo in the potato salad, because it would turn the potatoes grey. I turned the leftover seaweed tartare into a sort of tapenade, by adding garlic, salt-cured anchovies and capers to the blend. Great as a dip or spread on toasts. Sea spaghetti is going to be my new favorite no-carb dish! I was getting bored with zucchini noodles anyway. And that fried garlic sauce--just skip the ink--is so delicious. Not much in life is more pleasurable than a bowl of sweet red cherries. We’ve been enjoying the fruit since early June. But, as the cherry season draws to an end, I’m going beyond the proverbial bowl of cherries. I don’t remember eating fresh cherries as a kid. But I absolutely remember cherry pie, a favorite for the Fourth of July, made with canned cherries. 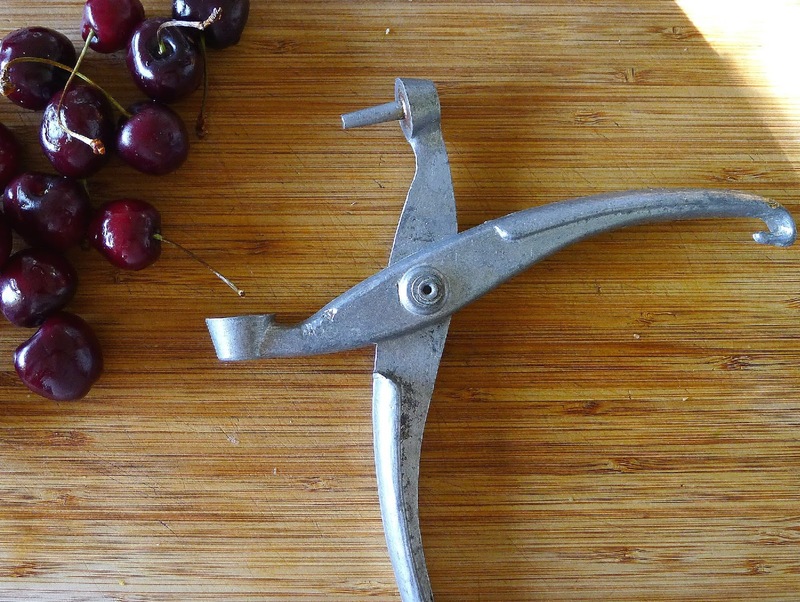 When I came to Spain and found fresh cherries in the market, I bought a cherry pitting device at the local ferretería (hardware store) and produced some pretty good cherry pies. Later, I went through a few seasons of making cherry clafoutis. 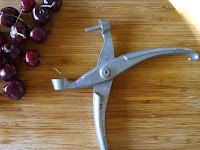 (My trusty cherry pitter did double-duty as an olive pitter.) But mainly, I’m happy to just pop cherries in my mouth. Spain is in the top ten of world cherry producers and exporters. More than a third of the crop is grown in the Valle del Jerte, in Extremadura (western Spain). More than two million cherry trees cover hillsides in this protected climate, creating spectacular sights when they blossom in early spring. 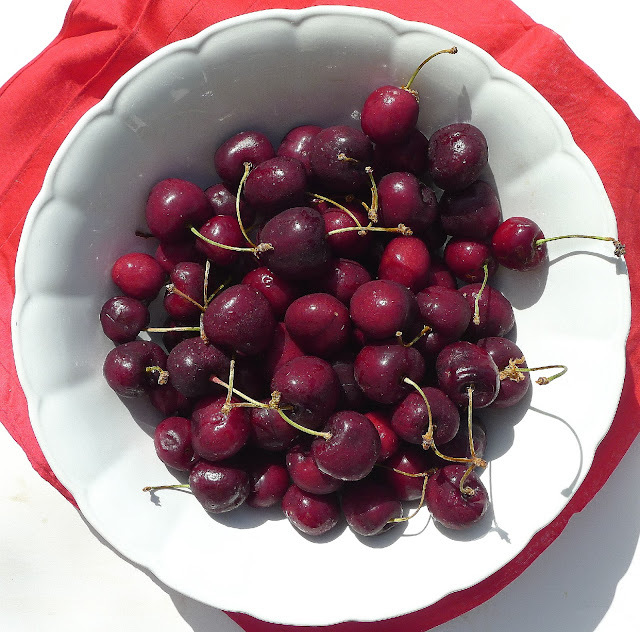 Cherries from the Valle del Jerte have Protected Designation of Origin. Picotas, on the left, are sweeter than cerezas, with stems. 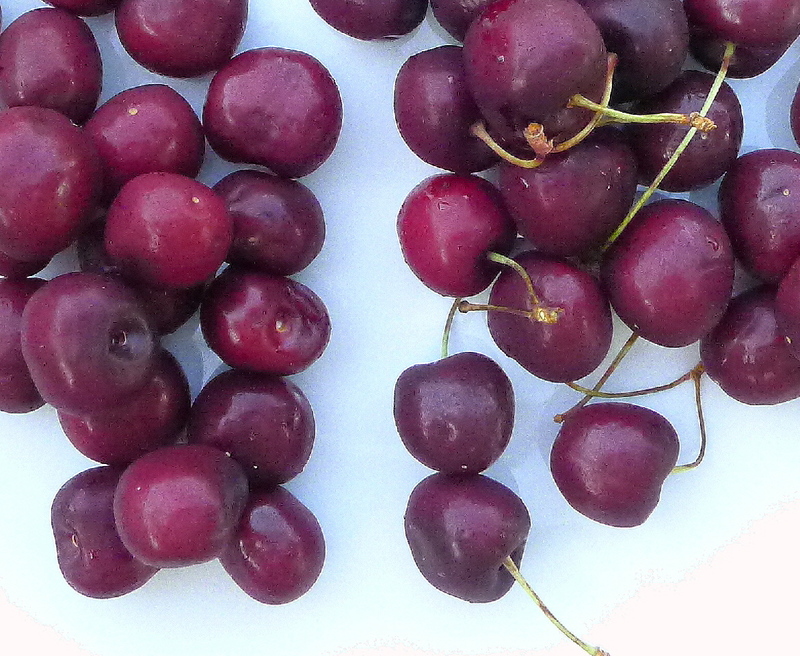 Two kinds of sweet cherries are grown in Spain—picotas and cerezas. Picotas, which are picked without stems, are darker, sweeter, with a crisper texture than cerezas, which are picked with stems. Both are superb. The guinda is another name for cherry in Spain, designating the sour cherry. 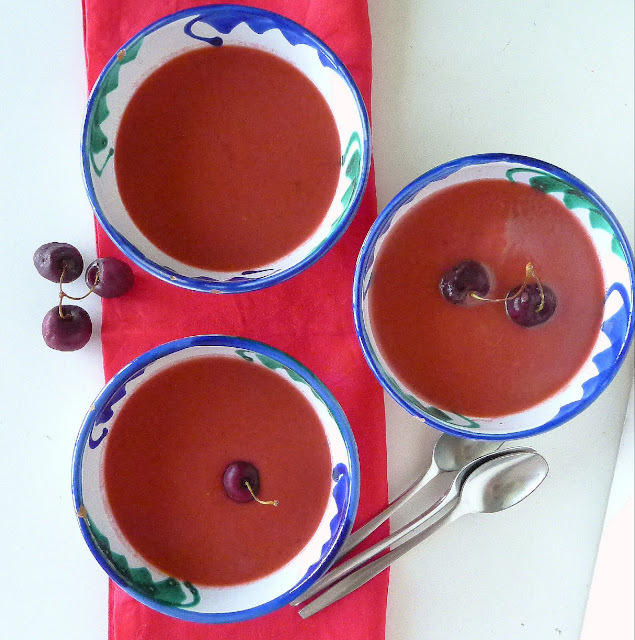 For my cherry-themed dishes, I'm making cherry gazpacho--fairly traditional, but with cherries as well as tomatoes--and a cherry "ketchup" to serve with marinated pork tenderloin. 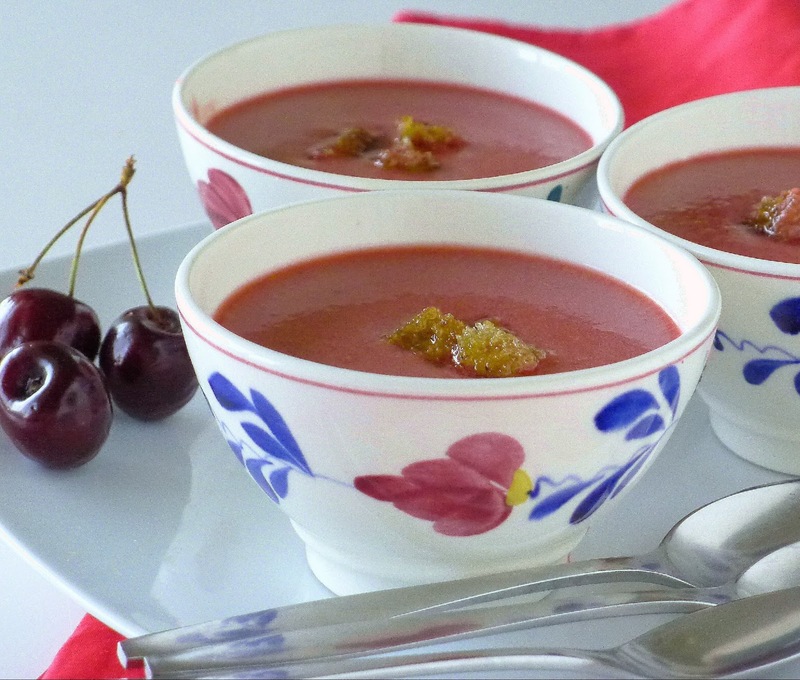 Cherries add a subtle sweetness to traditional gazpacho. Tangy cherry ketchup is a perfect accompaniment to quick-cooking pork tenderloin. 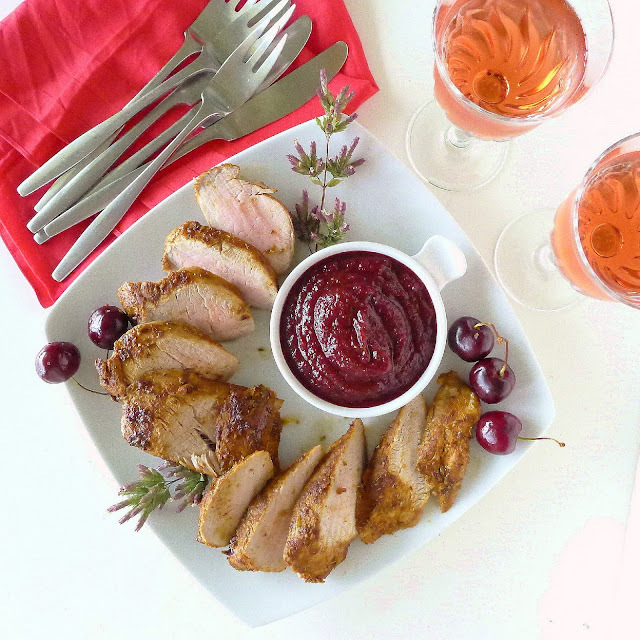 Add a cherry-inflected Garnacha rosado wine from Navarra for a lovely summer menu. Garnish the gazpacho with crispy croutons. Chef Dani García at his two-star restaurant in Marbella makes a cherry gazpacho served with a powdering of goat cheese and a sprinkling of pistachios. I’m using traditional croutons of fried bread, but adding non-traditional basil that seems to complement both the tomatoes and the cherries in the blend. 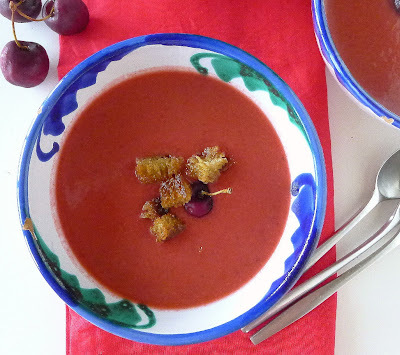 If you prefer a completely smooth gazpacho, sieve it after blending to remove tomato pips and cherry skins. Chill the gazpacho before serving. Break up the bread and place it in a blender container. Add the pitted cherries, tomatoes, green pepper, cucumber, onion, garlic and salt. Pour over the lemon juice and water and allow the mixture to soak for 30 minutes to soften the bread. If desired, sieve the gazpacho mixture. Chill it, covered. 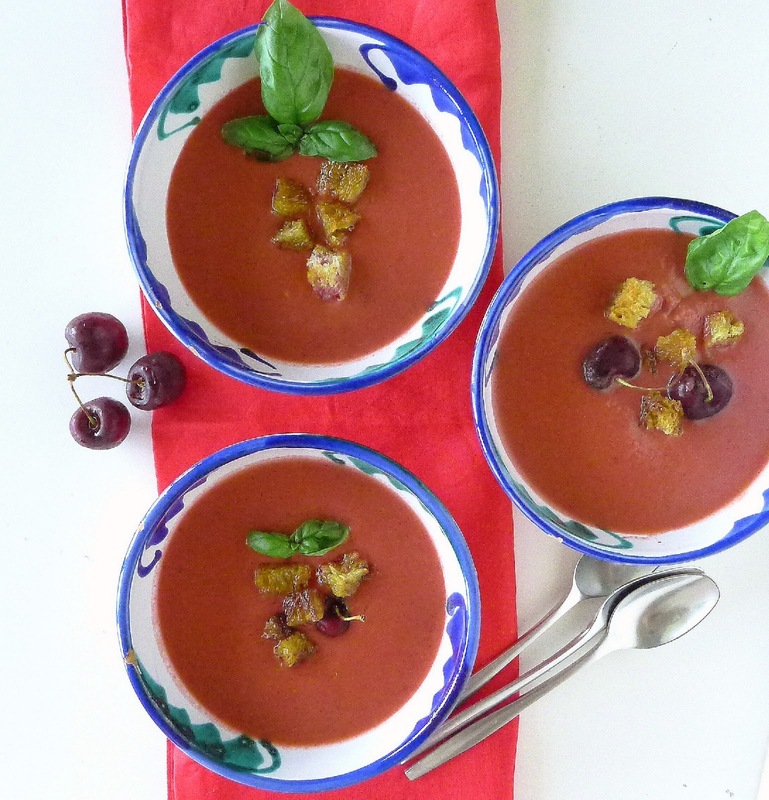 Serve the gazpacho with croutons and basil. Basil is a nice complement to both tomatoes and cherries. 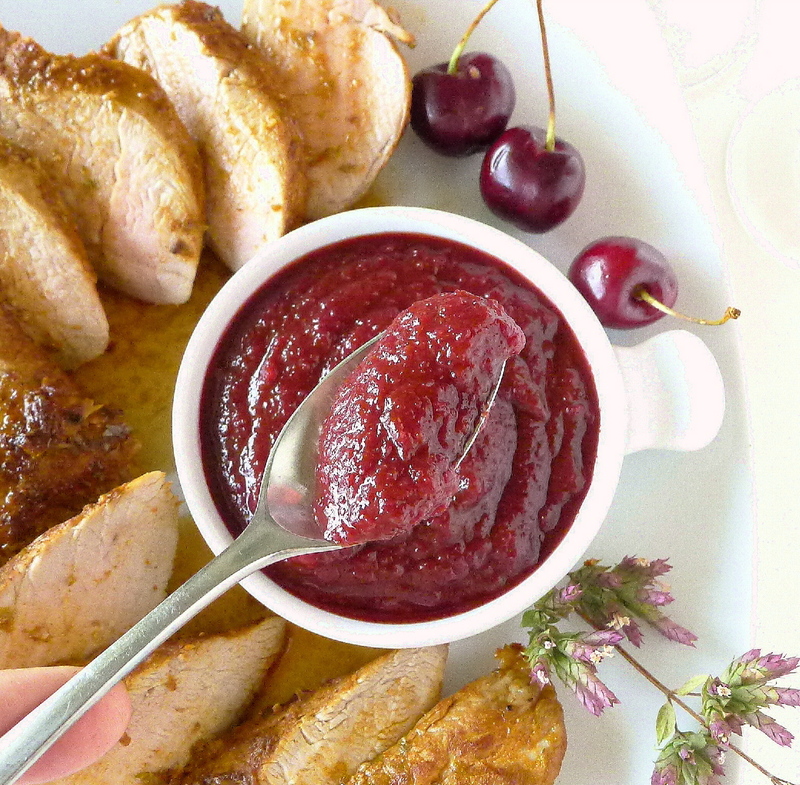 A little tangy, a little sweet, cherry ketchup goes with many foods. 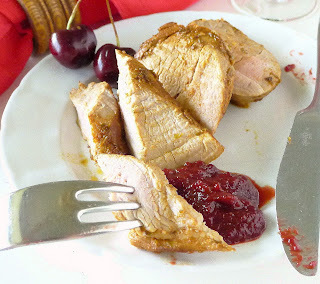 I'm serving this fruity, tangy ketchup with marinated pork tenderloin. But it would go well with turkey burgers or barbecued meat. Ketchup should have a balance of sweet and tart. I found the cherries sufficiently sweet, so I added no sugar. After adding the vinegar to the pureed cherries, taste the mixture and add sugar to taste. Place the cherries, onion, bell pepper, celery and water in a saucepan. Bring to a boil, then simmer, covered, 15 minutes until fruit and vegetables are tender. Discard the celery. Puree the cherries in a blender. Return the puree to the pan. Add the cayenne, allspice, ginger, salt, sugar, if using, and vinegar. 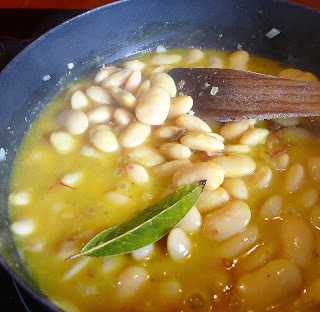 Bring to a boil, then simmer, uncovered, stirring frequently, until mixture thickens, about 10 minutes. Store the ketchup covered and refrigerated. Keeps up to one week. 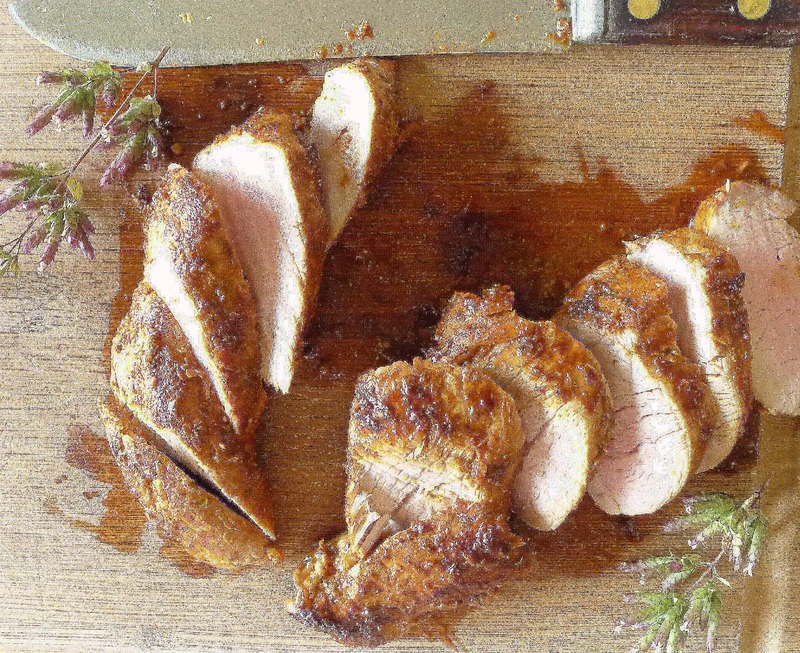 Pork tenderloins are rubbed with adobo marinade with oregano. A friend gave me a bunch of fresh oregano picked just before flowering. The pungent fresh herb inspired this adobo marinade, traditionally used to preserve pork. Here, it’s a rub for flavor. Spread it on the meat and marinate, refrigerated, at least one hour and up to 24 hours. 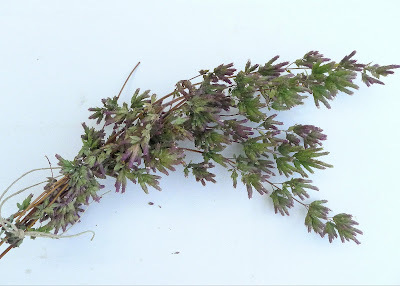 Picked before flowering, fresh oregano is incredibly pungent. I used three small tenderloins, which cooked fast, fast, in the pan. If you’re using one big tenderloin, finish it in the oven. In a mini-processor, grind together the garlic, pimentón, oregano, salt and pepper. Add the vinegar, 1 tablespoon of the oil and 1 tablespoon water. Spread this mixture on the tenderloins. Place them in a non-reactive bowl or container. Cover and refrigerate. Heat the remaining 1 tablespoon of oil in a skillet on medium heat. Sear the tenderloin until browned on all sides, about 4 minutes. Place meat on a cutting board to rest for 5 minutes. Slice the tenderloin crosswise, Spoon some of the pan juices over the meat. Accompany with cherry ketchup. I’ve got garlic! 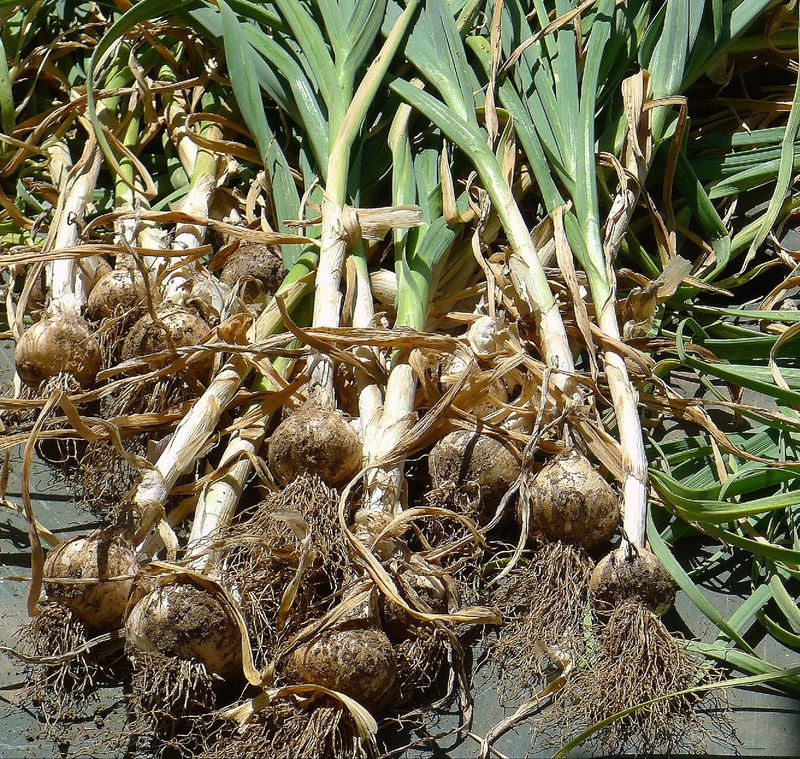 The garden produced a modest heap of the flavor bulbs. I’m celebrating the harvest by cooking al ajillo. Ajillo is the diminutive of ajo, garlic, meaning “a little garlic,” you know, just a smidgin. A heap of freshly harvested garlic. After it dries in the sun a few days, I trim the roots and stems and store the bulbs for use. In Spanish, the diminutive, of course, means “small.” But it can also denote affection or a tongue-in-cheek opposite exaggeration. So, you say you’re using "just a little garlic," when actually it's lots and lots! Today I’m making lamb chops sizzled with just a little (lots) garlic. 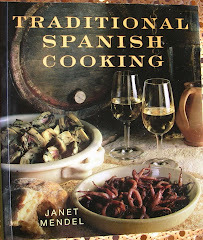 (Other recipes al ajillo are linked below.) I had these delectable chops in Las Pedroñeras, a La Mancha town that bills itself as the capital of garlic. There I learned that garlic over time gradually loses its punch. So when made with July’s newly picked garlic, the ration of cloves is minimal (one or two per lamb chop). But later in the year, when the flavor is milder, the number is increased (3 or 4 cloves per chop). 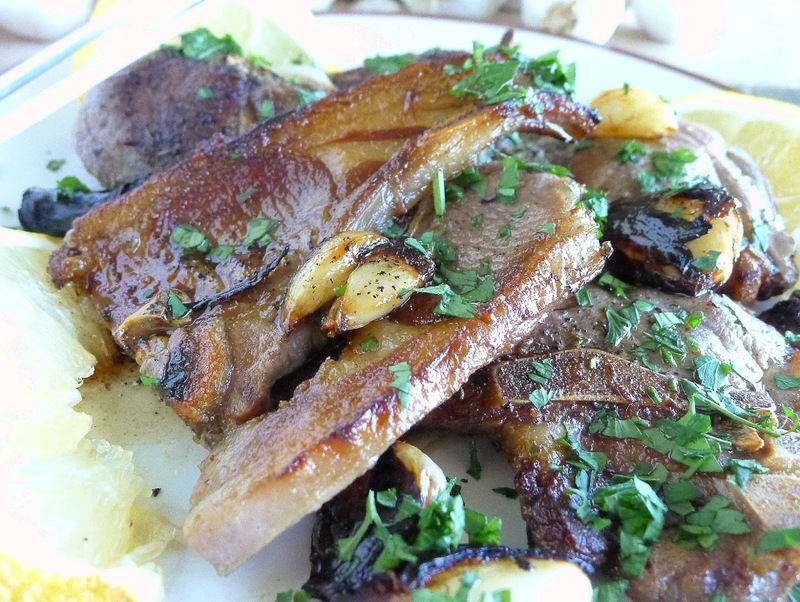 Lamb chops browned in olive oil with whole cloves of garlic are finished with lemon juice. 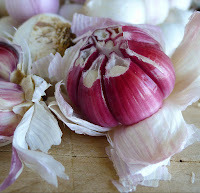 My fresh garlic keeps well for several months. 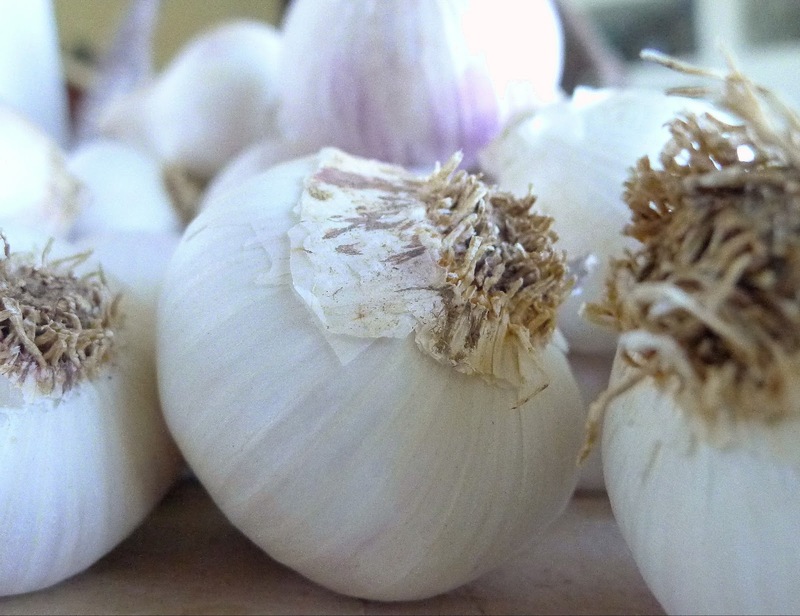 Store garlic in a reasonably cool, well ventilated place away from direct light. Eventually, in the natural cycle of things, the garlic will begin to sprout. Then it's finished. Mine will be used up long before that. 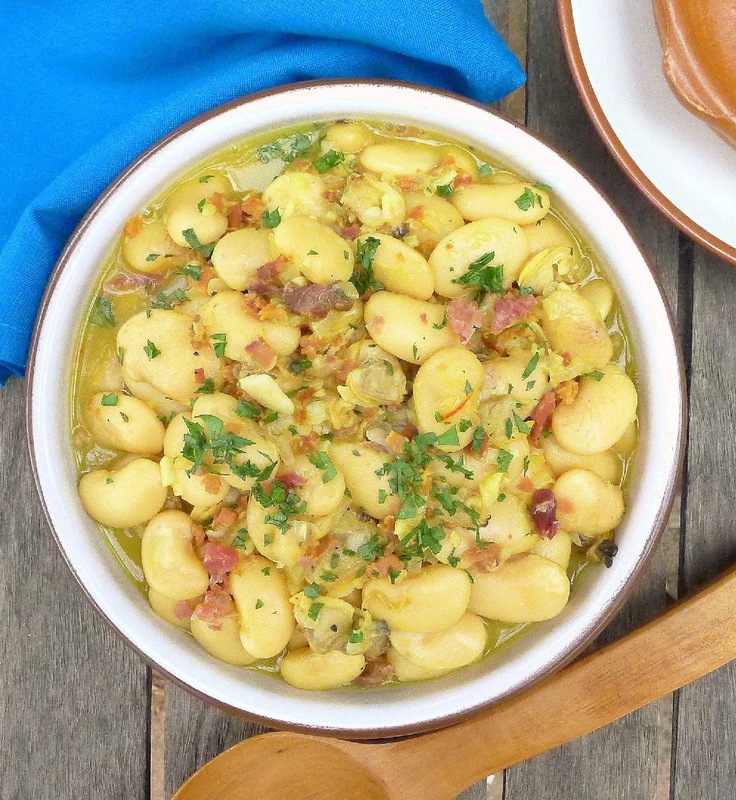 In this recipe, the cloves of garlic are not peeled. They are lightly crushed, just to split the skins, and fried with the chops in sizzling oil. The skins protect the garlic flesh from scorching. I like thick (1 inch) loin chops best. But, all I could get were small ones. These cook in an instant. Really. One minute per side, in a very hot skillet, just until browned. 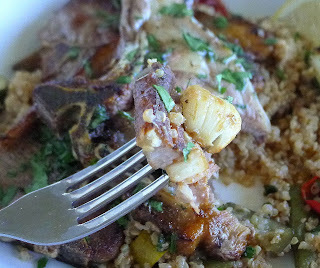 If you’re using thick chops, moderate the heat and cook them just until browned on both sides. That way they’ll stay a little pink and juicy on the inside. Serve the browned garlic with the chops. Peel the cloves or not. Let each person decide whether or not to eat them. 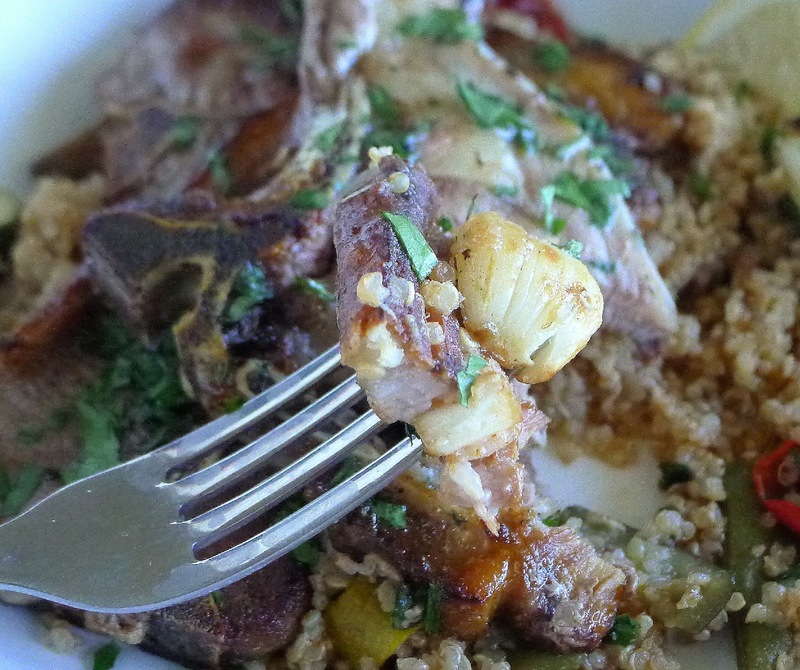 Serve whole garlic cloves with the chops. 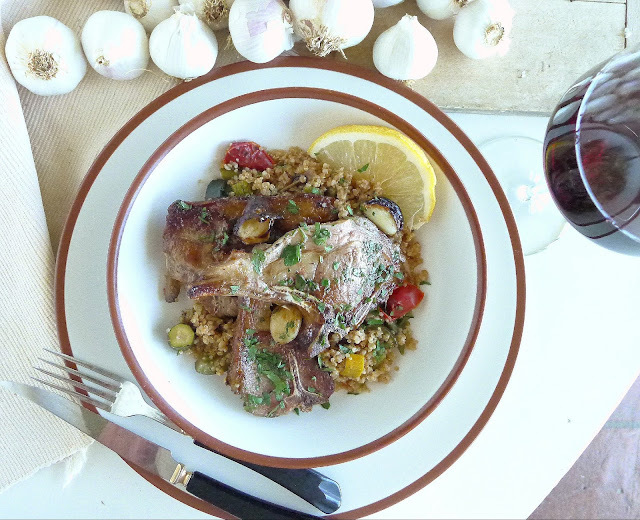 Lamb chops and garlic are plated on a bed of quinoa with vegetables. Rice or cous cous or, Spanish style, fries, are good alternatives. 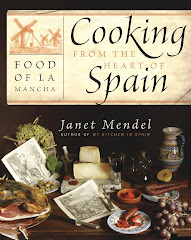 Perhaps a La Mancha tempranillo to accompany the dish. Sprinkle the chops with salt, pepper, and thyme. Using the side of a knife, crush the unpeeled cloves of garlic lightly, just to split the skins. Crush garlic cloves lightly to split skins. Heat the oil in a large skillet on medium heat. 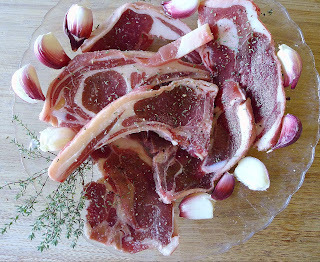 Add the lamb chops and garlic. Brown the chops on one side. Turn the chops and the cloves of garlic and brown reverse side. Remove the chops to a serving platter. Add the water and lemon juice to the remaining oil and garlic. Heat until sizzling. Pour over the chops and sprinkle with parsley. Serve immediately. 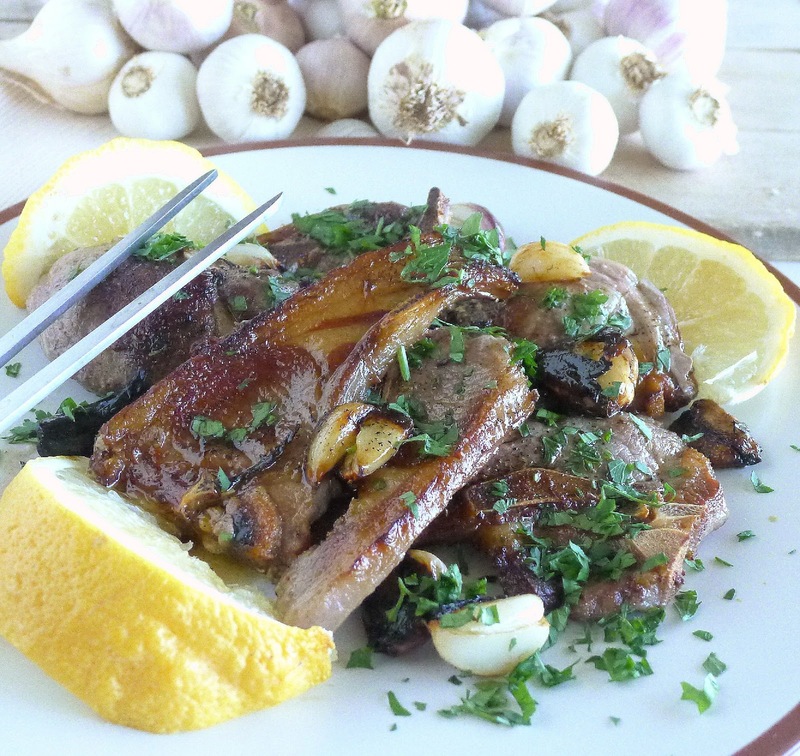 Do you dare to eat the whole clove of garlic? Mushrooms and Tofu al Ajillo. Pasta with Shrimp al Ajillo. Potatoes Mashed with Garlic Scapes. Eggs Scrambled with Shrimp and Green Garlic.